(Newser) – It's time for authoritarian North Korea to let in some free markets, urged Chinese Premier Wen Jiabao today, following a rare meeting with a high-ranking North Korean official, reports Reuters. 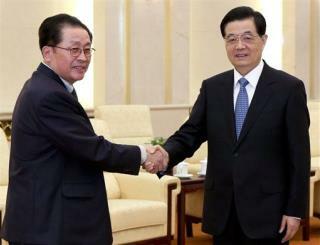 Wen and President Hu Jintao met yesterday with Jang Song Thaek, the powerful uncle of North Korea's young leader Kim Jong Un, encouraging North Korea to improve its laws, reform customs services, and encourage business investment. The two countries announced the creation of two special economic zones near the China-North Korea border earlier in the week. That's one helluva disparity in GDP, flanked by China 180 times bigger, and South Korea almost 30 times bigger. They have little choice in the long run. 100 to 1 The North Korea "high-ranking North Korean official" mysteriously disappears.